We recently worked with Muirhall Energy on their Energy Storage project in Erskine. 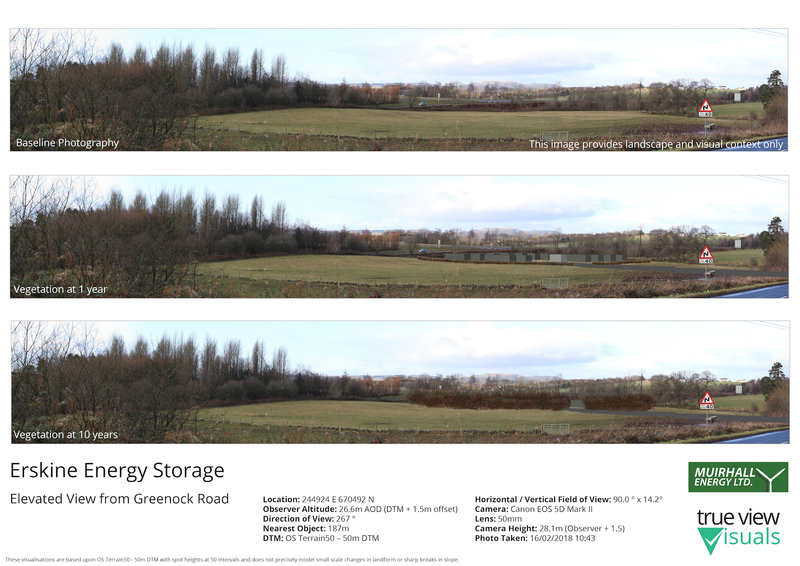 This project is to support the planning application for the construction of an energy storage site of 16 battery storage containers and associated other infrastructure. TrueViewVisuals produced the photomontages including screening effects from vegetation planting. This project has now been submitted into planning and is awaiting Renfrewshire councils decision (expected Summer 2018). The reference number is 18/0286/PP. To produce the visualisations that Muirhall wanted to complete this project, we created a 3D model of the site based on a 2D CAD diagram. We converted this 2d Diagram into a 3D model that we could view in our 3D viewing software. The terrain data was loaded from OS Terrain 50 to provide a terrain model to add this to. The process of converting to a 3D model highlighted that the vegetation area would not adequately screen the site. This allowed the planning team to redesign the vegetation area to better screen the proposal. The TrueVuewVisuals software allows the use of real photography to show the proposed development and provide a more realistic view of what the effect of the development will be. Photography for three viewpoints was supplied by the Landscape Architects and used to create 90° by 14.2° photomontages and matching wirelines showing the proposed development. One of the key aspects that Muirhall wanted to communicate was how the proposal would be screened by the vegetation that was to be added. In consultation with Landscape architects at Wood Group, we added in vegetation at appropriate heights after 1 year and 10 years of growth. These were to be a mixture of hedgerow and trees shown with similar foliage to the existing trees in the photography. As the photography was taken in winter, the foliage would be sparse and brown. For submission in the final planning application, the three photomontages were wrapped in a template to show all the metadata required. These are designed to show 3 views from the same viewpoint: the baseline (before the proposal was built, the proposal with vegetation at 1 year and the proposal with vegetation at 10 years).